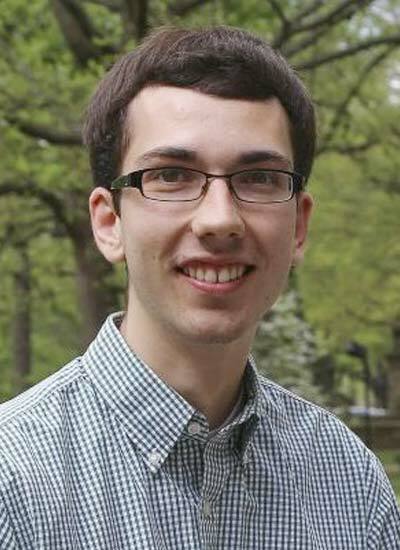 I am a senior physics major and computer science minor at Rhodes College. Coming to Rhodes College in the Fall of 2014, I was extremely impressed by the tremendous work done by the physics department's SPS chapter. Immediately I knew I wanted to be a part of this group, so I signed up to be a member of the Society of Physics Students at one of the year's first meetings. I have been active in the chapter ever since, along with being a member of the national society. Recognizing my enthusiasm for the organization, the leaders of our chapter at the time appointed me as first-year class representative. Through this position, I was responsible for communicating the general attitudes of the freshman class to the upperclassmen in order to ensure the needs of the new students were acknowledged. The next semester of my freshman year, an officer vacancy led me to be promoted to the position of club treasurer, which I held through the end of my sophomore year and was elected chapter vice-president my junior year. Beyond participating in the local SPS chapter, I have also attended both zone 10 and zone 12 meetings, and the 2016 PhysCon. I have greatly enjoyed these events- having the chance to connect with individuals of similar interests that I otherwise would not have had the opportunity to meet has been fantastic! This year I was also inducted into the Sigma Pi Sigma honor society, and I am excited by the possibility of meeting more enthusiastic physicists through this organization. I have already noticed the leadership experience I have gained through SPS yielding dividends in my other extracurricular activities. In the spring of 2015 I used this experience to start the Rhodes Engineering Club, catering to the needs of aspiring engineers across campus by helping them engage in design and construction competitions. My job as the Rhodes College Website Content Manager also provided challenges in communication and leadership that my SPS experiences have helped me face. Additionally, the lessons I’ve learned about communicating science through SPS have helped me impress on those lacking scientific backgrounds the relevance of my research, and scientific research in general. Beyond being grateful for the experiences I've had in SPS, I am excited about the continued opportunities to come through the program, and for applying all that I've learned from being a member. Along with my SPS service, I spend much of my time doing ultrasound research, having worked in labs at Rhodes College, Gustavus Adolphus College, the Mayo Clinic, and Duke University. After graduation I plan to pursue a Ph.D. in Biomedical Engineering with a focus on diagnostic ultrasound techniques. Ultrasonic measurements of the heel bone (calcaneus) are used commonly for osteoporosis screening. Pulses emitted by an ultrasound transducer are incident on the calcaneus, and the transmitted wave fronts are detected with a separate transducer. Despite the clinical usage of this technique, questions remain about the contributions to the measurement error caused by phase cancellations, diffraction, and interface losses. In the current in-vitro study, full field videos of propagating ultrasonic wave fronts incident on a calcaneus sample, along with transmitted and backscattered waves, were obtained using refracto-vibrometry. Pulses were emitted by a 500 kHz Panametrics V303 transducer. To optically detect ultrasonic wave fronts, the measurement beam from a Polytec PSV-400 scanning laser Doppler vibrometer was directed through a water tank towards a stationary retroreflective surface. Acoustic wave fronts (density variations) which pass through the measurement laser cause variations in the integrated optical path length between the vibrometer and retroreflector. The time-varying signals detected by the vibrometer at numerous scan points were used to determine the time evolution of ultrasonic wave fronts. The resulting videos enable visualization of the propagating wave fronts incident on the calcaneus and the backscattered and transmitted wave fronts. These videos enable direct investigation of wave front distortion due to reflection, refraction, and diffraction effects for pulses transmitted through the calcaneus during ultrasonic heel scanning.